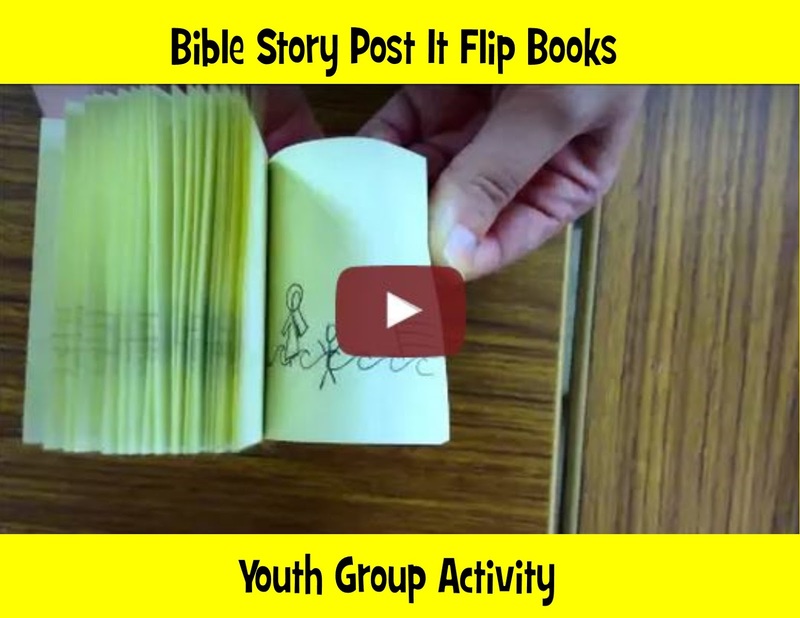 Just in case you needed yet another reason to love post its, here is a quick and fun youth group (or middle school classroom) lesson idea. Inspired by our favorite part of the Youcat , which of course is the fun little flip book which can be seen as you flip through the pages, (JK, the Youcat is great and well received by students), my youth group kids decided to try their hand at the art of simple animation by creating flip books. 1. Make sure the post it notes all stay in a stack. You don't have to use the whole thing, but should probably have at least 20-30 pages for a good animation. You can peel off the unused post its at the back when you are done. 2. If you are right handed, draw on the post its with the sticky part on the left and the open pages on the right. Make sure your illustration is more to the right than in the center. Leftys, do the opposite. 3. Keep it simple- not a lot of details, easy shapes, & stick figures. 4. Use a black ball point pen. You could go back and add a little color when you are done if you like. 5. Picture what you want the first page to be and the last page to be. Think of simple transitions to get from one to the other. 6. When you draw, press hard into the paper with the pen. Then, turn to the next page and you should see the impression from the drawing before. Use that as a guideline to place your objects and people. If something needs to be in the same spot, trace the impression. If you need for it to move in the animation, take note of the impression and draw it in just a slightly different place. Then on the next page move it slightly more, etc. 7. When you are done, flip to see if the transitions work. You can always go back and add a little more detail to make it seamless. OK- Challenge- Make your own Bible Story Post It Flip Books- and then post them on social media- GO! Wouldn't that be cool to see popping up everywhere? And because this is a quick project and there are seven videos and seven steps, I am linking up with Christy at Fountains of Home for Seven Quick Takes!